If you carry all your barbeque tools, pot holders or mitts and other accessories in and out of the house every time you grill, you have probably wished you could have a place close at hand to store them. These Pro Series double access doors are perfect for keeping items hidden as well as protected under your Legacy model gas grill built in to masonry. The cutout dimensions needed to install this 39" kit are 38" W x 19 3/8" H. Even the European style hinges and handles are commercial quality. The handles are horizontal, making it easy to keep a towel nearby. Handles and hinges are commercial quality. Install in a 38" x 19 3/8" cutout. 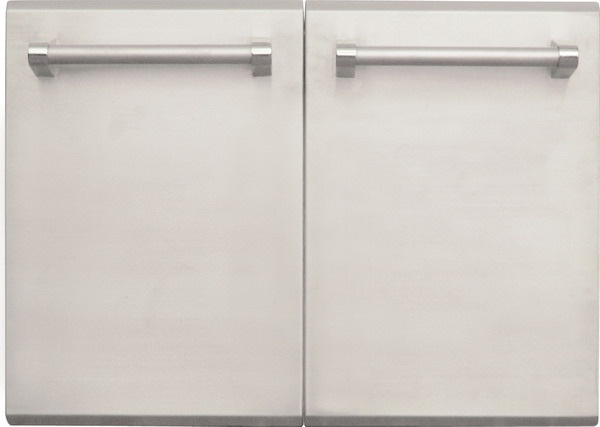 Stainless steel professional masonry doors.